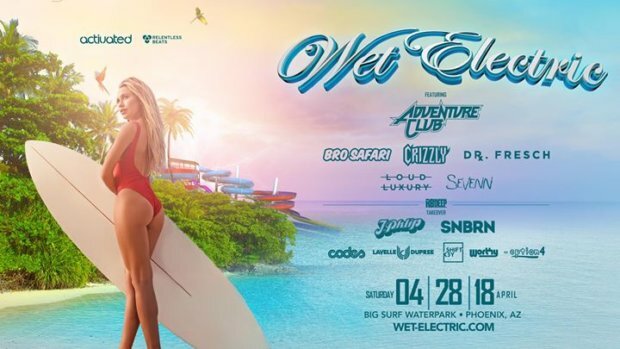 Wet Electric is scheduled to return Saturday, April 28, 2018 and I couldn’t be more excited! The event is back for its 8th rendition atBig Surf Waterpark in Tempe, Arizona. This is by far the country’s largest waterpark music festival and it continues to make tidal waves of sound. Huge acts are schedule to perform like Adventure Club, Bro Safari, Crizzly, Dr. Fresch, Loud Luxury and Sevenn. The festival will features a 2.5 million gallon wave pool (the largest in the country), renowned artists and DJs, waterslides, luxury cabanas, bars and much more. This will truly be a unique experience as it combines the thrills of a waterpark along with the sights and sounds of an electronic music festival. I can’t wait! General Admission tickets are on sale now for $49 plus fees. VIP passes, as well as the Super Party Pack Daybed Packages and Big Wave Cabana Packages are available starting at $125 plus fees. Lockers are available for rental at $15 plus fees. VIP is an 18+ area. For full details and to purchase tickets visit www.wet-electric.com.